By Powell Water Systems, Inc. based in Centennial, OREGON (USA). By Aquatech International Corporation based in Canonsburg, PENNSYLVANIA (USA). Metal-working factories generate a lot of oily effluent as a result of manufacturing processes. The coolant emulsions tailored to the individual application contain oils, waxes, greases and preservatives, as well as a cocktail of ingredients to improve product properties. The emulsions used must not be discharged untreated into the drain system or open bodies of water; they must be disposed of at high cost. By H2O GmbH based in Steinen, GERMANY. By Pure & Secure, LLC. based in Lincoln, NEBRASKA (USA). By Global Water Intelligence (GWI) based in Oxford, UNITED KINGDOM. Crude Oil Distillation (Atmospheric), Vacuum Distillation, Liquified Gas Production, Sour Water Strippers. By Raschig USA Inc. based in Arlington, TEXAS (USA). 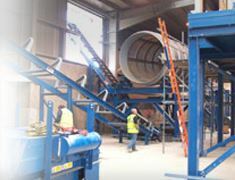 B & V Effluent Services have been successfully helping brewers and distillers throughout the UK with the management of their effluent systems for nearly 30 years. As a result the B & V Effluent Team holds a vast amount of specialist knowledge in regards to the problems faced within the alcohol industry including Copper Removal from discharge water and the management and reduction of pollutant levels in general to meet discharge limits. By B & V Water Treatment based in Daventry, UNITED KINGDOM.